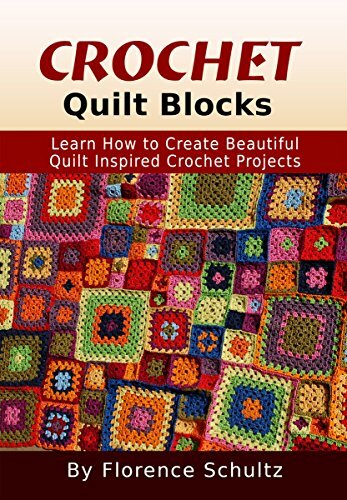 In her latest book, Crochet Quilt Blocks: Learn How to Create Beautiful Quilt Inspired Crochet Projects, Florence Schultz take inspiration from beautiful quilt blocks and translates them into crochet patterns. With the use of basic crochet stitches you can crochet lovely crocheted quilt blocks and create timeless heirloom pieces your family and friends will love for a long time. You don’t need to know any fancy or complicated stitches or techniques to work the patterns in this book. Florence provides a short tutorial of the stitches she uses in this book. That is all you need to know to crochet up the patterns in this book. Florence teaches you these stitches with easy to understand instructions and big clear images. Florence explains how to calculate how many crochet quilt blocks you need to create throws and afghans. She provides a table of sizes from baby blankets to king size bed. She helps you to understand a simple formula you can use for any size project you desire. You will learn how to crochet a Granny Square, and a small solid Granny Square to create the Crosspatch Quilt Block. The Corner to Corner pattern is worked in both the Intarsia technique and the popular Corner 2 Corner (C2C) technique. In the Log Cabin Quilt Block pattern, you learn how to attach the yarn and work with color to create a spiral effect. Florence includes how to join squares using single crochet in the Four Corner Quilt Block to create a decorative frame around the Granny Squares. Her last pattern, the Easy Rail Fence Quilt Block, uses rectangular Granny Squares and color to form the Rail Fence pattern. Once you complete your afghan you’ll want to add a pretty edging. Florence provides five different edging patterns with complete instructions and big clear images. The edgings include the shell edging, double shell edging, Granny edging, chain three edging, and double chain three edging. If you’ve ever admired quilts, then you’ll enjoy crocheting these blocks to create your own work of art. This book is written for beginners, but anyone of any skill range will appreciate the creativity and use of color in the patterns of this book. Don’t miss out and get your copy today! Crochet: How to Crochet Corner 2 Corner and Ripple Afghans. Popular and Timeless Techniques for You to Learn.